With Eltechs ExaGear Desktop you can run Intel x86 application on your Rikomagic Linux Edition Mini PC simultaneously with common native applications. ExaGear is a virtual machine that implements virtual x86 Linux container on ARM and allows you to run Intel x86 applications directly on ARM. It is like QEMU but 4.5 times faster! You can even run Windows applications on your ARM Mini PC if you install Wine. You can run ExaGear Desktop on ARM-based Mini PCs with Linux such as Rikomagic Linux Edition devices (currently V5LE, MK902IILE, MK902LE & MK802IVLE) ODROID, CubieBoard, CuBox, Utilite, Jetson TK1, Wandboard, Banana Pi etc. Also you can run ExaGear Desktop on your ARM-based Chromebook with Linux. Owners of Raspberry Pi 2 Model B can use ExaGear Desktop too. ExaGear Desktop cannot be used with the first generation of Raspberry Pis: Model A, Model A+, Model B, Model B+. This spring we are planning to launch a special version of ExaGear Desktop for these boards and you can pre-order it through the online form. Payment is processed through our store. Software download link and license key will be emailed you after we get your order and process your payment. Usually it takes one business day. Please, carefully check system requirements before you buy Eltechs ExaGear Desktop license. - ARMv7 instruction set with NEON and VFP32. - 3G/1G virtual memory split. For more details on how to check system requirements refer to Eltechs Tech Forum. 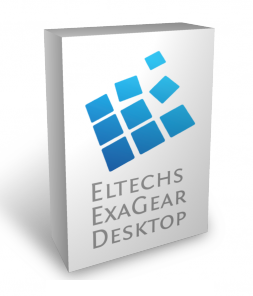 Eltechs ExaGear Desktop allows you to run user space 32-bit Linux x86 applications. Current version does not support applications that require kernel modules. There is no 3D hardware support for x86 applications. Also you can run 32-bit Windows applications if you install x86 Wine. ExaGear is extremely fast! For benchmarking we used SysBench. The benchmark was built for the ARM and Intel x86. Results of ARM-based (or native) tests were compared against x86 tests ran under Eltechs ExaGear Desktop. For both sets of tests the same ARM machine was used: Odroid-XU (Exynos5 Octa Cortex™-A15 1.6Ghz quad core). We took QEMU user mode emulator and compared its performance with the performance of Eltechs ExaGear Desktop. For benchmarking we used GeoBenchmark. The benchmark was built for the ARM and Intel x86 with options ‘-O3 -mfpu=neon’ and ‘-O3 -msse3 -mfpmath=sse’ respectively. Results of ARM-based (or native) tests were compared against x86 tests ran under Eltechs ExaGear Desktop and under QEMU. For both sets of tests the same ARM machine was used: Odroid-XU (Exynos5 Octa Cortex™-A15 1.6Ghz quad core).